Under the bright lights of CES 2014, Intel received a lot of press attention when it showed off a non-working prototype of a heart rate-monitoring earbud system. But now, some five months later, LG is selling a fully realized version of the exact same concept, and no one seems to care. 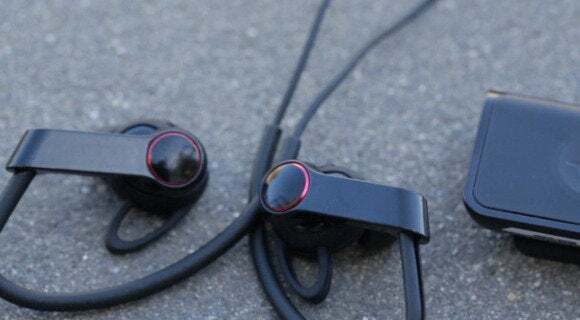 It’s a shame that tech journalists aren’t paying more attention to LG’s Heart Rate Earphones, because the $180 hardware delivers decent audio quality and accurate heart rate data—and that’s really all it needs to do. It’s a simple addition to the wearables space, but introduces an entirely new product category to consumers. 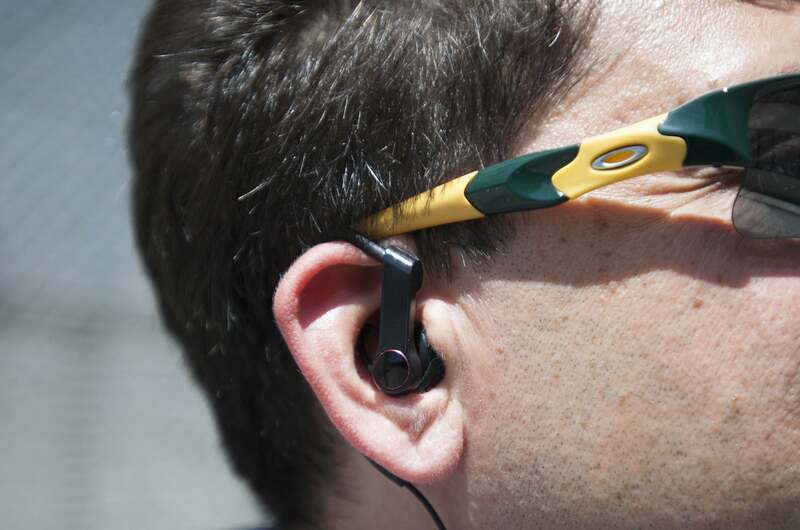 And unlike so many other wearables, the Heart Rate Earphones actually work. LG’s earphones effectively combine two popular exercise accessories in a single piece of hardware. You probably already listen to music during your cardio workouts, so why not let your earbuds collect heart rate data as well? This approach eliminates the need for one those uncomfortable, chest strap-based heart rate sensors. LG’s system employs a spectroscopic sensor in the body of its right earpiece, measuring blood flow beneath the surface of your skin. 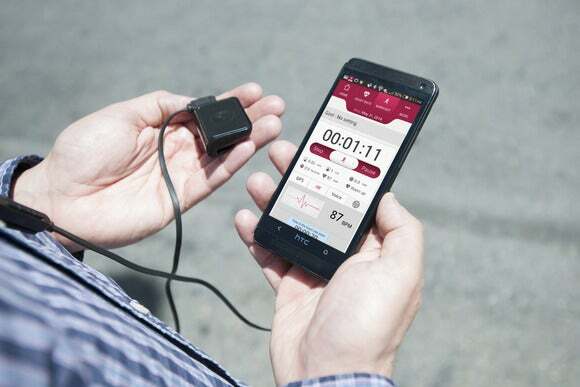 According to LG’s FAQ, the system is just as accurate as chest strap sensors, and veers from the accuracy of hospital electrocardiograms by no more than 7.4 percent. I couldn’t compare the Heart Rate Earphones to an ECG, but A-B testing with a chest strap monitor indicated LG wasn’t lying. 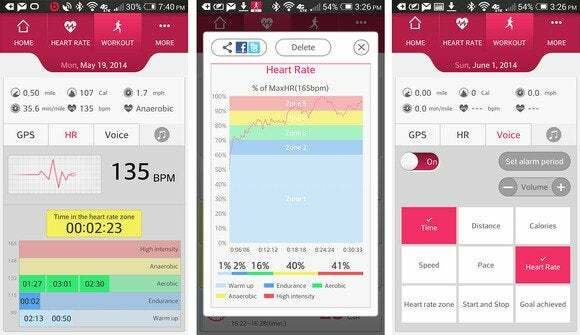 Using the LG Fitness app, you can see heart-rate data—and a deluge of other metrics—in real-time. But best of all, the earphones can show you accurate, continuously updating heart-rate numbers during the heat of exercise. You won’t get this level of reporting from Samsung’s Gear Fit wristband or even the Basis Band, which has never claimed reliable real-time accuracy akin to what you get with a chest-strap monitor. Who knew we all have two antihelices? The LG earphones connect to a matchbox-sized wireless transmitter that you can clip to your shirt or workout shorts. The transmitter connects over Bluetooth to a wide variety of mobile devices: iPhone 4s and later, and Android devices running 4.3 and later. It charges to maximum battery capacity in about three hours, and is good for about four hours of use. But remember: Once you run out of battery life, you don’t just lose the ability to gather heart rate data. You also lose Bluetooth connectivity for listening to music. The transmitter doesn’t have a display, so you need to rely on one of three other methods to get at your data. Throughout testing, I viewed my data on the LG Fitness smartphone app, but you can also see your numbers on the display of LG’s Lifeband Touch wristband, a separate $150 purchase. In the position you see here, the earphones can record heart-rate data perfectly fine, but they still need to be rotated forward for better audion quality. The third option is to use LG’s Voice Guide feature: A synthesized voice shares metrics like heart rate, distance traveled and calories burned directly through the earphones. I don’t like how these reports interrupt music playback, and at least you can define exactly which data points will be voiced (there are nine total), as well as the frequency of the voice reports. Pairing the transmitter to my HTC One (M7) was relatively painless—and much easier than actually getting the earphones into my ears. The asymmetrically designed ear pieces are marked L and R (remember: the sensor is intended for your right ear). But it was always a struggle to get LG’s “sharkfin,” a stabilizing piece, into the antihelix of my ear, and then wind an ear loop around the rest of my anatomy. The upshot is that LG’s earphones are much more difficult to insert than standard earbuds, and positioning is critical, as you’ll soon see. Here's a good shot of the earphones' "sharkfins," the angular pieces that need to fit snugly underneath the folds of your ears. For my first few days of testing, I was disappointed with the earphones’ sound quality. They produced adequate but not remarkable volume, but the real letdown was a serious lack of bass response. 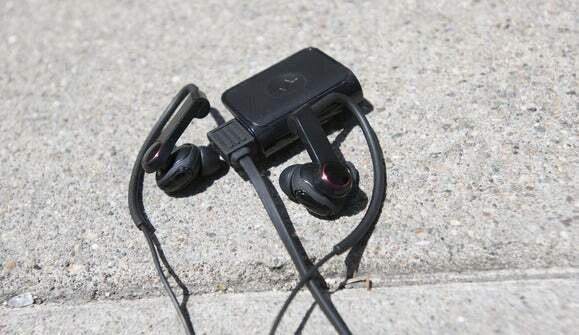 My takeaway was that I might make these my full-time workout earphones just for the heart-rate sensor, but I would miss the lack of low-end thump. It turns out I wasn’t wearing the earphones correctly. You basically have to screw them into your ears, rotating them as far forward as possible in a clockwise motion. If you merely insert them into your ears, without that rotation, you’ll still get heart rate data, but none of that essential bass. I’d like to see a troubleshooting note in the user manual FAQ (“How can I improve bass response?”), but I no longer have complaints about sound quality. It’s more than sufficient for amped-up, bass-bumping workouts, and can drown out the din of gym equipment. It would be nice if the Bluetooth transmitter had its own simple heart rate display. As for heart-rate data accuracy, I couldn’t ask for anything more. My real-time heart-rate numbers scaled evenly and logically as I increased and decreased exertion during sessions on an elliptical machine. Even better, I tested the Heart Rate Earphones against an Adidas Micoach Heart Rate Monitor attached to a NuMetrex Training Shirt, and the LG system matched the chest-sensor system beat for beat. I believe only physicians might need a greater level of accuracy. LG’s software is the weak link of the Heart Rate Earphone experience. The LG Fitness app is packed with features for setting heart rate and exercise goals; mapping workout routes over GPS; viewing heart rate in real-time and within various intensity-level zones; digging through the minutiae of historical workout data; and much, much more. But the sheer visual density of all these features is dizzying. The app is packed to the brim with charts, graphs, buttons, tabs, toggles and every other software interface element imaginable. The UI design lacks consistency and flow, and no single feature is immediately self-evident. It’s an inscrutable interface that could really benefit from some type of tutorial video—even if that video has to be 30 minutes long to explain all the features. Alternately, LG could provide much clearer user manual instructions, or offer a second, much more simple app for people who just want barebones data. To that point, I hope the next generation of this product puts a basic LED data display on the Bluetooth transmitter. Relying on the mobile app or a separate wrist wearable seems like an unnecessary hassle. But even the confusing app interface isn’t a deal-breaker. The bottom line is that the Heart Rate Earphones deliver as promised. And the real-time data reports pushed me to increase the intensity of my workouts—which is what really matters in a world in which wearables are expected to work. Click here for my first, hands-on impressions of LG's Heart Rate earphones. With perfectly respectable audio quality and accurate heart rate data, LG introduces an entirely new product category into the wearables world. Good sound (assuming a proper fit). Fancy that: A wearable that delivers on its promises. Difficult to put on; easy to put on incorrectly. No display on Bluetooth transmitter.